Project Overview Implementation Plans Site Description Specific Project Objectives & Deliverables In Situ Observations EO Data Requirements Project Reports Study Team View/Print All JECAM – Sidebar Image Project Overview Crop identification and Crop Area Estimation: Identify rice fields with its polarimetric responses and scattering mechanisms and estimate the rice acreage accurately. 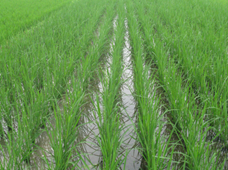 Crop Condition/Stress: Rice phenological stage retrieval, providing timely and accurate information about rice growth condition, in order to plan cultivation practices (irrigation, fertilization, etc.). The terrain is flat, with the average altitude mostly less than 10m. The climate belongs to the transition region between the subtropical and the temperate zone, with four distinct seasons. The annual average temperature of the test site is about 13 to 16?. The average precipitation is about 800 to 1200 mm every year, and more than half of the precipitation occurs from June to September. The sunshine hours can be up to 2400 every year. The soil type of this region is mostly yellow brown clay, which is more favorable for rice plant development. The main paddy varieties in this area are hybrid and japonica rice. There is one rice crop a year, with the growth cycle about 150 days, from early June to late October or early November. 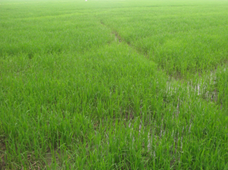 There are two rice planting methods in the test site, transplanting and direct-seedling, which will produce two different rice field structures (Fig 2(a) (b)) and have a certain impact on rice yields. The size of rice field parcels is 1700m2 or so. In this study, forty-two sample plots were selected in the test site, covering twenty-nine transplanting fields and thirteen direct-seedling fields. The distribution of these sample plots is also showed in Fig 1. Figure 1. 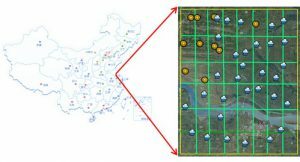 The location of test site and the distribution of the sample plots, cloud and sun mean transplant and direct-planting rice fields respectively.